Hitherto, the study of India’s railways has run along a few, increasingly well-travelled tracks. 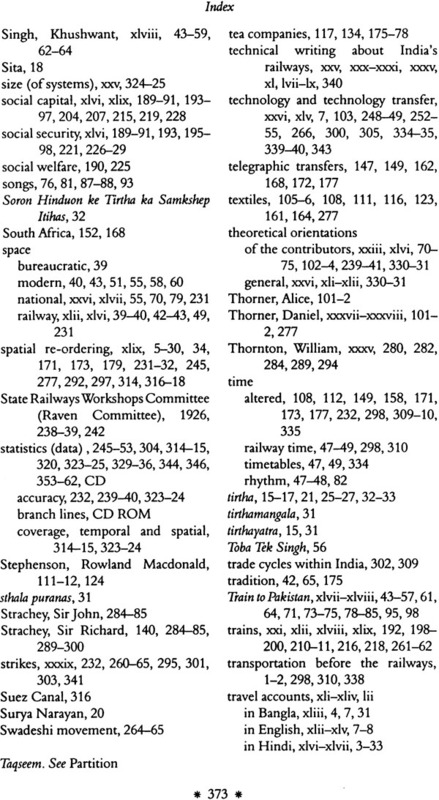 The central goal of 27 Down with its nine, new, railway –related studies-and much else thanks to its enclosed CD-ROM-is to explore some of the neglected dimensions of India’s colonial and postcolonial railways. The contributors, a stimulating mix of younger and older scholar, explore vastly different aspects of India’s railways, past and present. 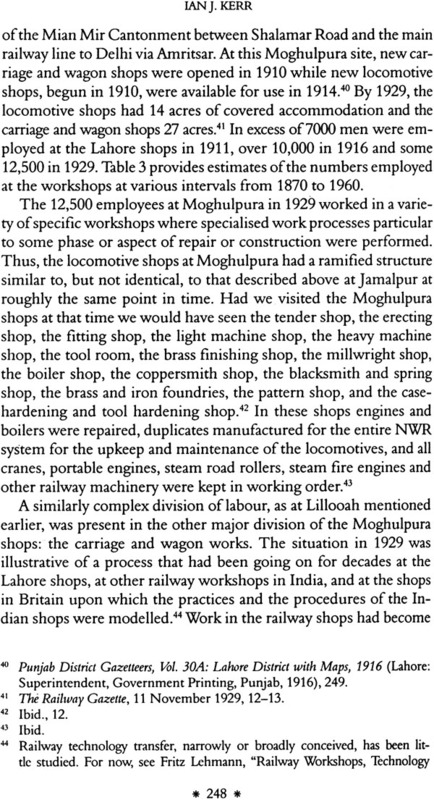 Railways and the nineteenth-century capitalist development of South Asia, porters at a twenty-first-century Mumbai station, late nineteenth-century Hindi accounts of train travel, post 1947 films and writings that represent railways during the Partition of India, railway art on Bangladeshi rickshas, railway workshop labour, financing and managing the railways of North India, an exploration of why India’s railways did not contribute more positively to colonial India’s economic development, plus much more are found in the text and on the CD-ROM. 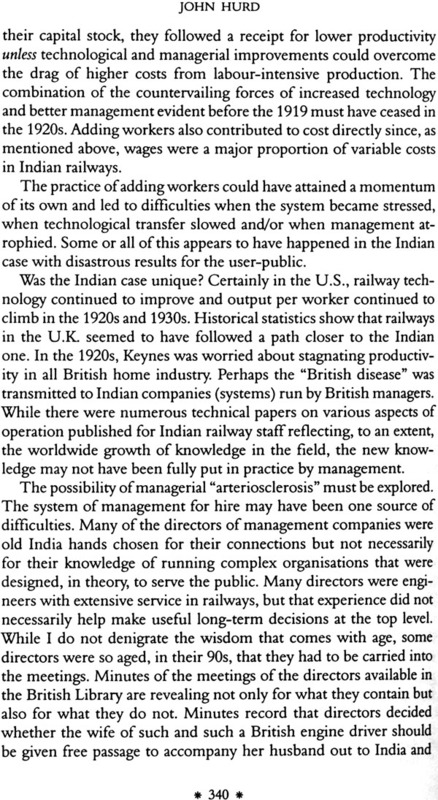 Thus, social, political, cultural and economic dimensions of India’s railways are among the few departures in Indian railway studies found within this volume. 27 Down is a train with multiple destinations. Each exploratory trip is different but the contributors share an interest in the method of travel, India’s fascinating railways. Ian J. Kerr is a Research Associate of the Department of History, School of Oriental and African Studies, University of London and a Senior Scholar, History, University of Manitoba, Winnipeg, Canada. 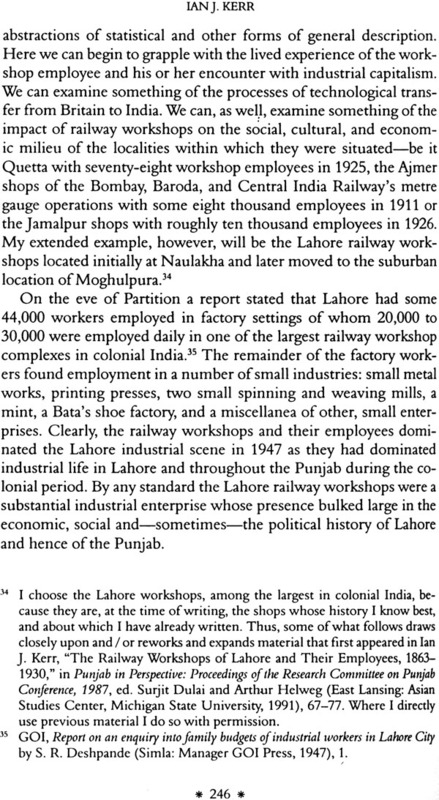 He has written or edited many books or articles examining aspects of India’s railway and labour history. Trains departing from the main termini within the massive Indian railway system usually are designated by a number and the word “Down”. Trains arranging at the same termini are designated by a number and the word “Up”. Thus, “27 Down”, as in the title to this volume, designates a departing train. This volume provides a fascinating collection of essays which, individually and collectively, carry the reader towards new destinations within the many areas of India’s colonial and post-colonial world, as affected by the railways. The CD enclosed with this volume complements and supplements the textual contributions. It contains 1) a contribution particularly suited to the presentational capacities of a CD; 2) statistical material; 3) “Veiled in Vapour”, an evocative, elegiacal, 30 minute video of the last scheduled passenger steam train in India; 4) some examples of other visual and textual materials available to those interested in the railways of India. Railways have operated in India for over 150 years yet, as this volume demonstrates, much about them remains unexplored. Conceptually, substantively, and both it is time to open new lines of investigation and to invigorate the traffic along existing lines. Hopefully, this book will do just that. The contributions and their footnotes, the bibliographies, and the material on the CD (which includes a consolidated bibliography) open up new lines of research and facilitate future research by others. 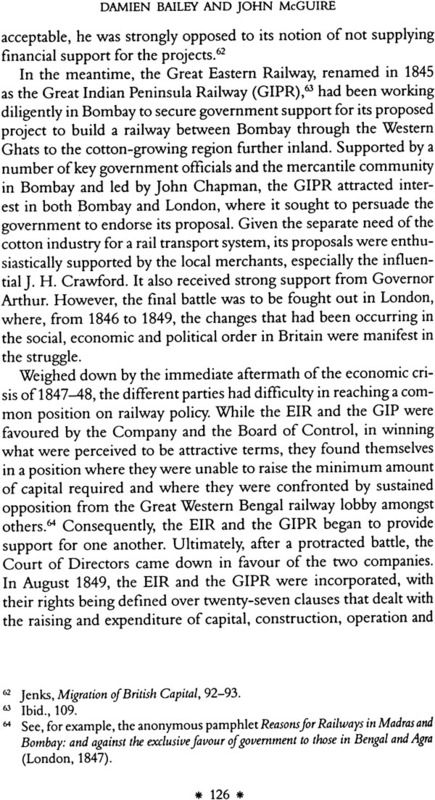 “27 Down” has another point of reference that captures something of the immense significance railways play, and have long played, in the life of India and Indians. One of the many films produced in India with considerable railway content was the Locarno festival award winning “27 Down” (1973) that interwove a love story with the mystique and lore of the railways. One striking scene in “27 Down” displays an empty platform at Victoria Terminus in Bombay, now the Chhatrapti Shivaji Terminus (CST) in Mumbai, swarmed in a split second by peak-hour passengers. The film generally and that segment in particular evokes something of the great importance that the railways have in India. One scholar identifies, “a railway platform and a train” as “one of the most enduring images of Hindi cinema” and “signifier of modern life.” Thus, “27 Down” in the title of this volume refers to a body of moving images that represent the railways. Obviously we have no moving images of the earliest decades of railway operation in India-railway construction in the early 1850s and operation as of 1853 predated cinematography-but some railway engineers in the 1850s were avid practitioners of the then recently introduced technology of still photography. Professional photographers, also, soon identified India’s railways as a fascinating topic for their developing skills and for the increasingly numerous consumers of their published photo-journals. Because of another new departure in Indian railway studies present in this volume, namely the CD that is enclosed in the back jacket, we are able to provide readers with a sampling of images from India’s railway past and present, along with statistical and other data. The CD enhances the value of this book as a source for railway-related information and as a guide to further research. 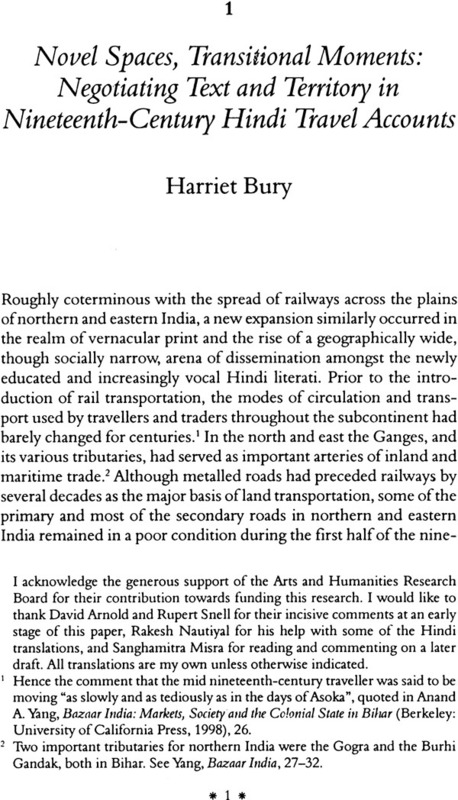 Because this volume seeks to open up or invigorate research into India’s railways, neither the editor not the contributors utilize a common methodological and conceptual approach. Quite to the contrary, the book embraces eclecticism in everything except subject matter. The contributors come to the railways from diverse perspectives and each contributor approaches her or his dimension of the railway experience via the particular concerns and techniques that inform his or her disciplinary background. Scholars anchored in literary or cultural studies mingle with anthropologists, quantifying economists, and historians of labour and technology. But that is exactly the central point of this shared effort. The railways of India can be studied in a myriad different ways, each fascinating and significant in its own right, and each contributing to a better understanding of the man ways in which the development and operation of the railways contributed to the making of colonial and postcolonial India. I once called for Indian railway studies to “become more active, multi-disciplinary, extensive, and multidimensional,” this volume demonstrates how multi-disciplinary, extensive and multidimensional active research can be-and this volume should be only the beginning of such an effort! Many research trains potentially wait to depart from their stations. In the pages ahead we offer some departures along new or improved lines in the hope that many others, stimulated by what they read and/or see (remember the CD-ROM in the back jacket), will undertake their own journeys of discovery into what is, undeniably, one of the world’s most significant and fascinating railway systems. 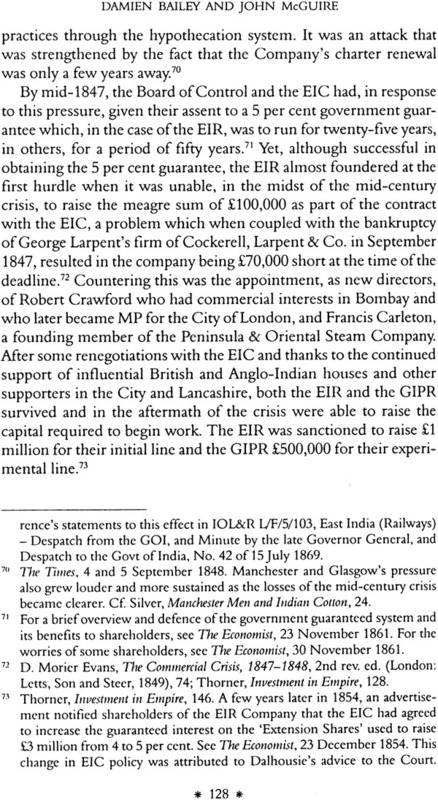 A demonstration of the extent to which the departures undertaken in this book are new or newly invigorated requires a summary of the state of Indian railway studies. The next part of this introduction, therefore, provides a bibliographical essay to help situate the contributions that follow. The concluding section of the introduction introduces the contributions, explores their novelty, and makes a few suggestion for further lines of research. 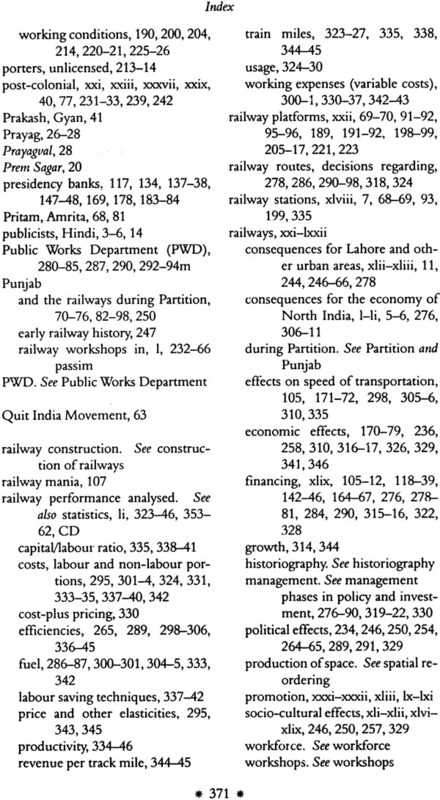 One can turn to many works-some of them are listed in the bibliographical essay that follows, and in the footnotes and bibliographies of this volume-to obtain the background information about the construction, development and operation of India’s railways that give context to the essay that follows. 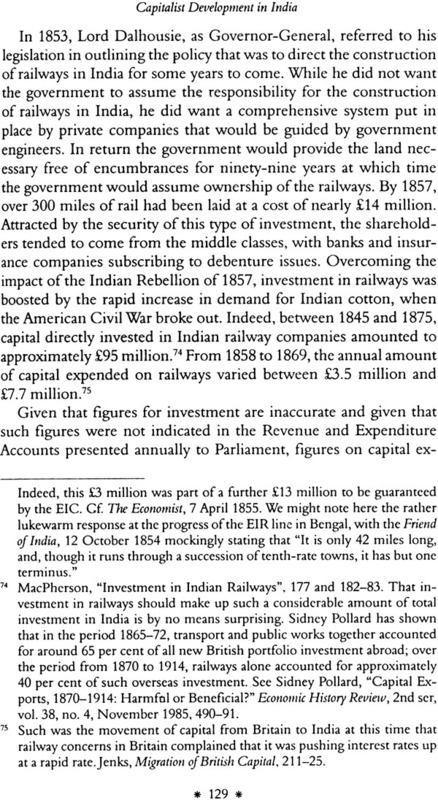 Statistical information for the period 1853-1947 can be found in the invaluable series of data developed by Morris David Morris and Clyde B. Dudley, “Selected Railway Statistics for the Indian Subcontinent (India, Pakistan and Bangladesh), 1853-1946-47,” Artha Vijnana: Journal of the Gokhale Institute of Politics and Economics 17: 3 (September 1975) which, thanks to the permission of the Gokhale Institute and Professor Morris, has been reproduced in full in the CD that is part of this New Departures publication. 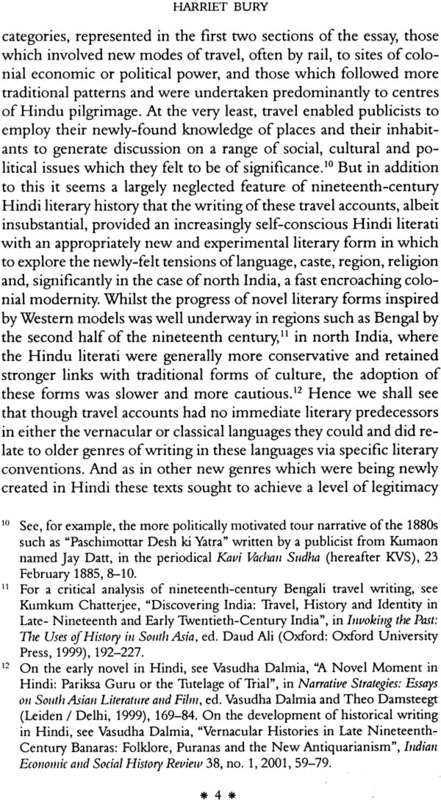 It is gratifying to this editor, to the general editors of “New Perspectives in South Asian History” and to Orient Longman to be able to make this material available again. Suffice it to write here that railway construction in India began in 1850, the first stretch of line officially opened in April 1853, route miles totaled 838 in 1860, 23,627 in 1900, and 40,524 in 1947. Of these totals virtually all were built to the 5’6” (broad) gauge until 1869, when a State-owned and State-managed system was begun, using the metre gauge (3’3”). New building continued at both gauges thereafter such that, in 1947, roughly half of the total mileage was broad gauge, 16,000 miles were metre gauge, and some 4,000 miles used narrower gauges. 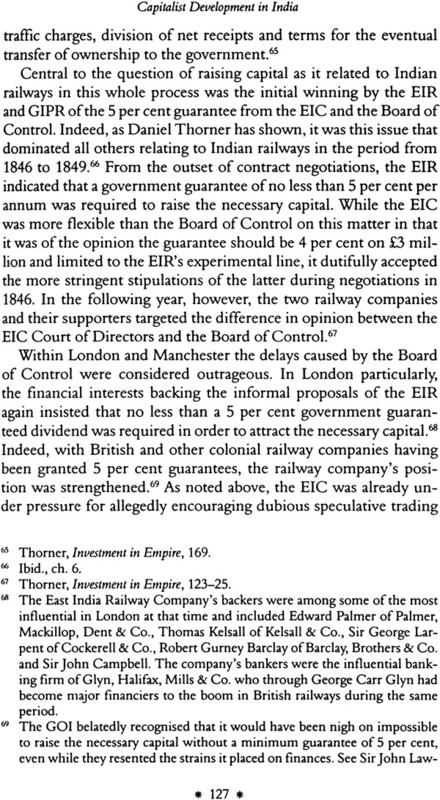 Break of gauge was a problem and in the closing decades of the twentieth century the State-owned and State-run Indian Railways (IR)began an extensive programme of converting metre to broad gauge. Partition resulted in a division of lines between India and Pakistan but subsequent construction in India gave India a route network of some 63,500 kilometres (40,000 miles) in 2005, India had the world’s fourth largest railway system in the early twentieth century, a ranking it retains (or surpasses depending on the measure one uses) in the twenty-first century. 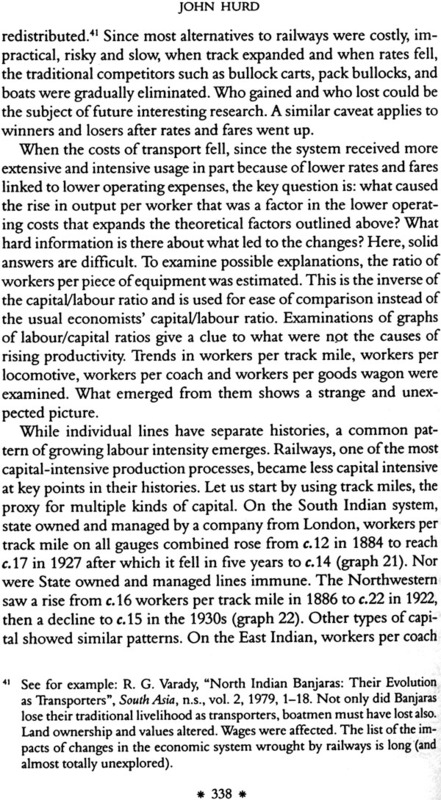 Railway employees exceeded 380,000 in 1900, topped one million in 1947, and numbered 1.4 million in 2005. 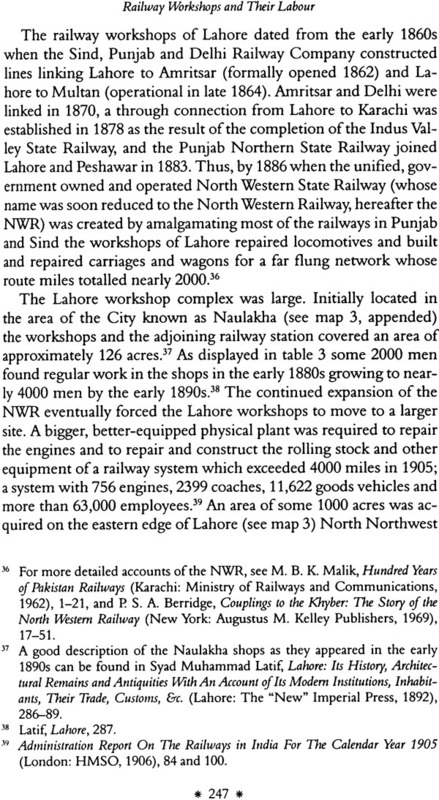 Millions more were needed to build the railways. 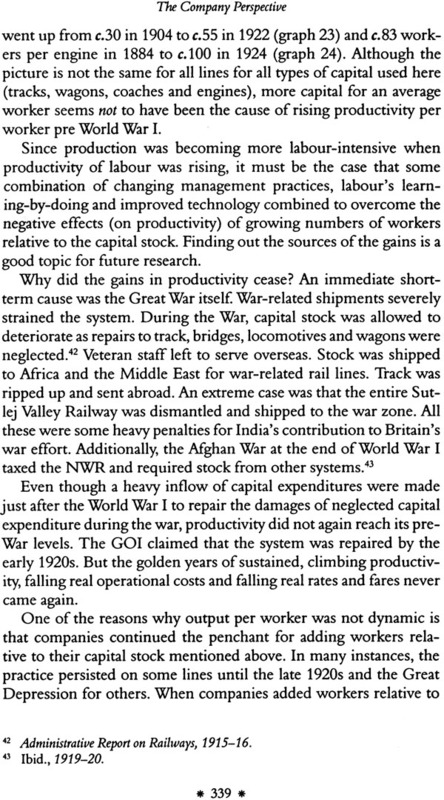 In the reporting year 1945-46 (1946-47 saw major disruptions, of course) India’s railways carried 100,630,000 net tons of goods (single counted series) and over one billion passengers. 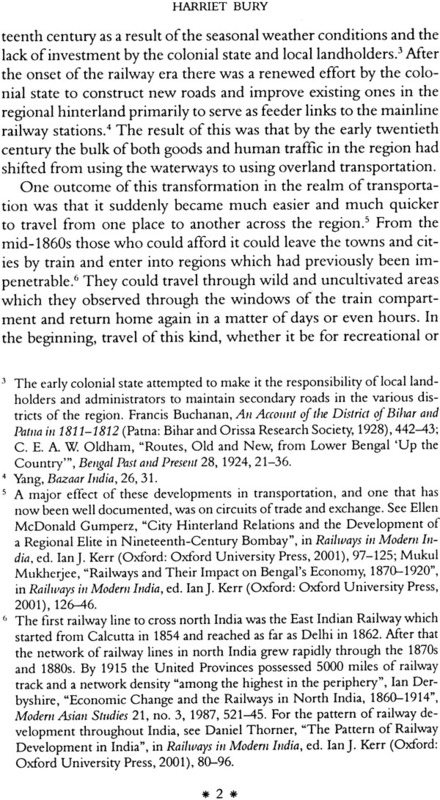 The railways had been, were, and remain today at the infrastructural core of the making of modern India. 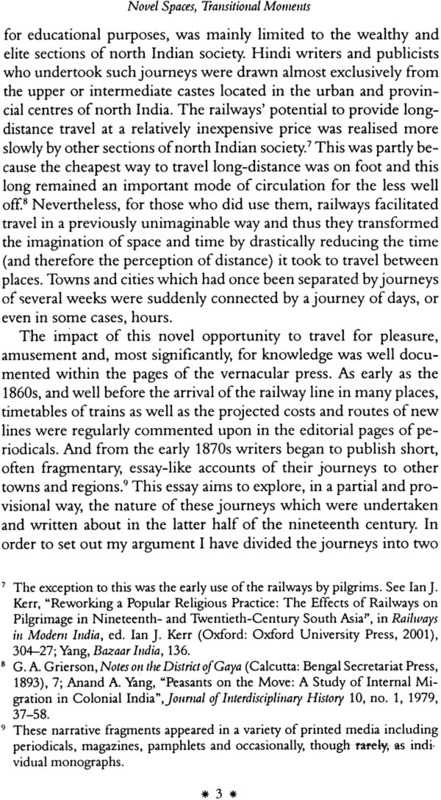 A survey of the published writing about India’s railways or, what is not a at all the same thing, railways for India exposes a major paradox: over 150 years of writing (the published outflow began well before the first line opened for traffic) has resulted in a large body of railway-related writings yet, at the same time, our understanding of many important aspects of India’s railway past and present is limited and unbalanced. Part of the imbalance stems from the fact that many publications were officially sponsored or commissioned by governmental agencies or the railways. These studies usually had a specific, problem-oriented focus, sometimes a technical focus, and their author (s) were confined to their investigatory remit. In the survey and bibliography that follows, my goal is to mention important or representative works. 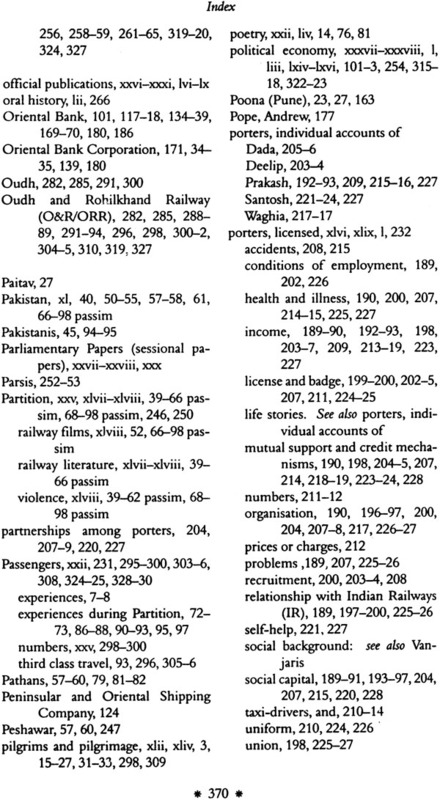 The categories and listings are more detailed for the post- 1947 secondary literature because that is the body of writing most relevant to an attempt to situate the contributions to 27 Down. Each category, surveyed in one or more paragraphs, is identified by a subheading with the same subheading appearing in the bibliography located at the end of this introductory chapter. Full citations to the authors and/or works mentioned in the text appear in the bibliography, under the corresponding subheading. References within the text are limited to author and/or title and date when needed, and author alone when that suffices. Many additional items not mentioned within the text, i.e., under the appropriate category (the subheading), are found in the bibliography because a lengthy (in some cases) listing of titles makes for tedious reading. The categories themselves are loosely-defined and are neither exhaustive nor proscriptive; they are heuristic categories. Some titles could appear, but do not, under more than one subheading. 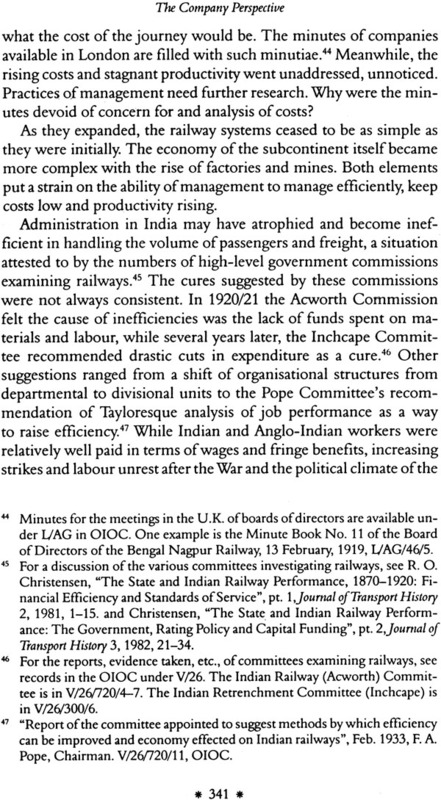 Only works with a specific focus on India’s railways-or occasionally with a substantial contribution within a more general work-are mentioned in the text or listed in the bibliography. 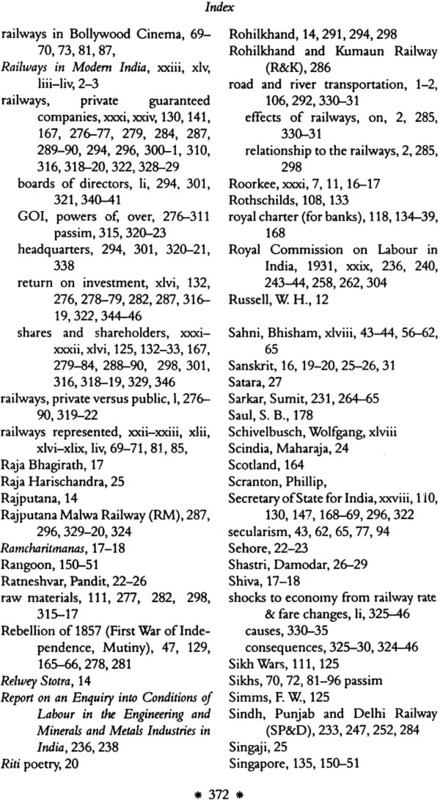 This means that works important (conceptually and/or substantively) to a wide range of Indian railway topics are not listed. Thus, important works as disparate in character as Daniel R. Headrick, The Tentacles of Progress: Technology Transfer in the Age of Imperialism, 1850-1940 (New York: Oxford University Press, 1988); David Arnold, Science, Technology and Medicine in Colonial India, The New Cambridge History of India, 3:5 (Cambridge: Cambridge University Press, 2000), and Manu Goswami, Producing India: From Colonial Economy to National Space (Delhi: Permanent Black, 2004) do not appear. Penguin Random House India Pvt. Ltd.